The Humane Pennsylvania Foundation is solely dedicated to supporting animal welfare efforts, both in Pennsylvania and around the nation. It supports our partner organizations, as well as other organizations through direct grants. The Foundation is supported through charitable donations and bequests. Unlike most other foundations which provide animal welfare grants as an afterthought, Humane Pennsylvania Foundation is dedicated to one purpose: supporting effective programs, services and organizations which help animals in need. If you care about animals and want to support a strong Foundation whose program initiatives and are directed by skilled animal welfare professionals, not bankers, consider Humane Pennsylvania Foundation. 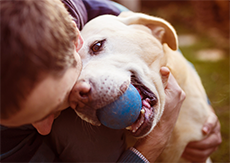 Our professionally managed funds- because bankers should make investment decisions, not animal decisions- allow the Humane Pennsylvania Foundation to make the most of your estate planning, charitable gift, or donor directed fund. It can allow you to support a specific program, a specific region, a specific organization, or even make estate arrangements for surviving pets. And it can do all that with less administrative overhead to allow your generosity to go farther. Often, our greatest capability to support the charitable efforts important to us are made in our estate planning. It’s why we say, “Change the world. Change your will.” We hope you’ll join us in changing the world for animals in need. The Humane Pennsylvania Foundation believes that the best ideas for a progressive new vision of animal welfare can come from anywhere and from any sized organization. We also believe that innovation should be encouraged. We also believe animal welfare organizations have better things to do than jump through unreasonable application hoops, so we make the process very easy. Grant applications require only a simple letter and forms which should be readily available to any well managed organization. Humane Pennsylvania Foundation grants are unrestricted grants of up to $5,000 offered in support of any 501(c)(3) organization demonstrating innovation, originality, and, most importantly, results. Grants are awarded twice a year in October and March. Multi-period grants are available and recipients may reapply. A one to two page letter requesting unrestricted grant support and explaining what exceptional, unique or innovative program, policy or approach the requesting organization is trying and what the specific outcome is expected to be. A copy of the requesting organization’s 501c3 determination letter, most recent audit, and current approved fiscal year budget. Materials may be forwarded in hard copy, electronically, and links to needed materials may be forwarded in place of files. Humane Pennsylvania Foundation is currently restructuring the grant application process and will not be accepting any proposals for funding until further notice. We hope to have our new structure in place so that we may resume distributing grants later this year. September 1 for October grants. February 1 for March grants.